Gang-tool lathes under the GT mini, GTV and PLG brands for high volume production and reduced job changeover time. 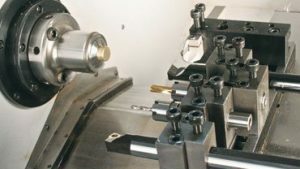 An incredibly compact and affordable gang-tool lathe designed for secondary operations and other simple turning jobs. Longer travel, more powerful motor and FANUC control. Still a compact size gang tool lathe but now has a slant-bed design and longer gang tool table. Control has been upgraded to FANUC 0i-mate. 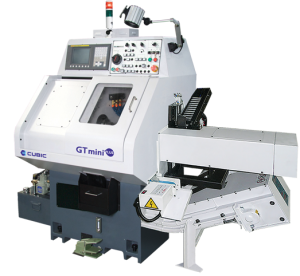 With a positional accuracy of 0.00005″ (50 millionths of an inch) and rapid traverse rate of 787 ipm, GTV is a gang tool lathe that delivers both speed and accuracy. 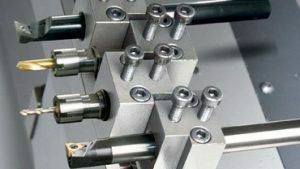 If GTV and GT mini are gang tool lathes focused on small parts, then PLG series represents the gang tool concept enlarged. Not only are the X and Z travels longer, the largest in the series PLG-60 has a bar capacity of 3″ and can use 10-inch chuck for workholding.